Ovince Saint Preux is the owner of a rare record: He has the most shoulder choke victories in UFC history. And this weekend, Saint Preux gets a chance to add to his record against the first man he ever pulled the submission off against, Nikita Krylov. 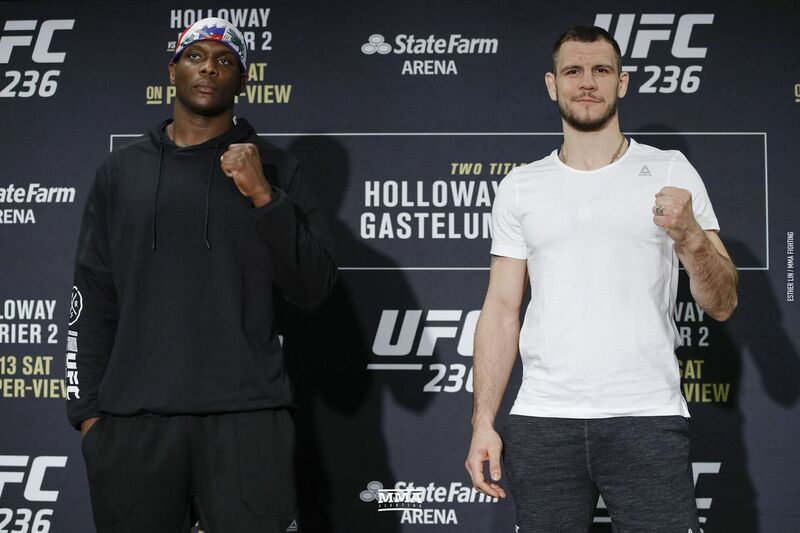 On Saturday, Saint Preux and Krylov will rematch as the first fight on the main card of UFC 236. The two first locked horns five years ago at UFC 171, with Saint Preux submitting Krylov with a shoulder choke when the Ukrainian fighter held onto a guillotine too long. That choke, known colloquially as a ‘Von Flue’ choke after Jason Von Flue used it to submit Alex Karalexis at UFC Fight Night 3, was only the second such choke in UFC history. But ‘OSP’ isn’t planning on having an easy time getting it a second time against Krylov because the two have evolved so much since their first fight. Saint Preux could use a statement win. The former interim title challenger has lost two of his last three and needs a win if he wants to stay in the 205-pound title hunt. Saint Preux says his recent skid is the result of overthinking and that he needs to get back to his younger self where he was loose and free-flowing. Krylov presents a great opportunity to do just that. It also gives him a chance to try out something new he’s been working on: trash talking. “I think the biggest change in my game is also the biggest distraction in my game,” Saint Preux said. “Me constantly trying to slow down things instead of being automatic. My earlier fights I didn’t care. I just went in there and whatever was presented to me, I went out there and did it. I did it within the mindset of staying in the game plan. Now I want to sit back and try to be patient but this is not a game that you can sit back and be patient, you’ve got to actually bite down on your mouthpiece and go forward. Of course, that doesn’t mean Saint Preux won’t try to secure his fourth shoulder choke; after all, the move has gone on to become one of Saint Preux’s signatures; he locked it up in back-to-back fights in 2017, as well. He’s had such success with it that the move is now affectionately referred to as the ‘Von Preux’ choke, and if the opportunity presents itself on Saturday, OSP would be happy to take it.